We've entered the age of digital currency. Bitcoin has gone from relative obscurity to being a household name. In December 2017, the coin smashed its way through the $19,000 barrier like an angry bull in a china shop. Bitcoin’s dominating presence tends to drown out its contenders. But there are actually quite a few other digital currencies that investors should pay attention to, too. Of these, a handful is poised for dynamic growth. And we published this report to talk about one of the most promising: Litecoin. In 2017, Litecoin skyrocketed alongside many of its digital currency peers, hitting highs near $400 before retreating because of regulatory pressure from many countries. How is it better than Bitcoin? 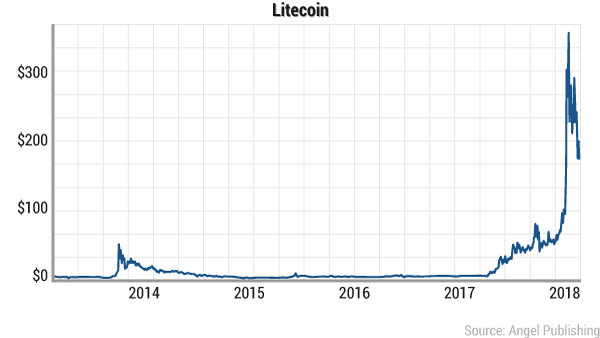 In October 2013, former Google engineer Charles Lee introduced the world to a new altcoin: Litecoin. The coin was introduced as the silver to Bitcoin’s gold, and Lee promised that the digital currency would fix many of Bitcoin’s problems. At the time that this report was written, Litecoin has a market cap of over $9.67 billion. And Litecoin’s technology makes it one of Bitcoin’s most aggressive competitors. If you evaluate the two currencies from the surface, they could be twins because they share dozens of valuable characteristics. Like Bitcoin, Litecoin was created to provide a peer-to-peer transaction system. It allows individuals to make payments or transactions anywhere in the world with relatively low fees. And like Bitcoin, Litecoin is decentralized. There's no centralized authority, building, or headquarters for it. The currency flows freely on the internet. What this means is it's far more secure than paper currency. Because no government can regulate or overproduce it, Litecoin’s value rests in the hands of the people. Miners use computers to process Litecoin transactions, which are presented as algorithms that the computers must solve. When the computers solve the problems, more litecoins are added to the network and the miners are rewarded with their shares. There is a fixed amount of litecoins in the world — the volume of litecoins can never exceed $84 million. After we reach that point, the currency has the ability to be broken down into minute payments. The mining process and the currency’s finite cap shield Litecoin against hyperinflation. Bitcoin was the first digital currency in the world, and that has given it a leg up on the competition. But Bitcoin’s early arrival is also the source of many of its shortcomings. Today, the developers behind major digital currencies have identified Bitcoin’s weaknesses and have altered their currencies to fix the issues. Every time a transaction or exchange happens in a digital currency network, the information involved with that transaction is recorded in a “block.” Each of these blocks is added to the continuously growing blockchain. Anyone on the network has access to the information in the blockchain. This means that transactions are public knowledge, even if the users remain anonymous. Users are only tied to the transactions taking place on the blockchain through an electronic signature that offers a fair degree of anonymity. This framework also makes digital currency very secure. Even though both Litecoin and Bitcoin use blockchain technology, Litecoin has a far faster transaction speed with a transaction being confirmed every 2.5 minutes, compared to the 10 minutes it takes to confirm a Bitcoin transaction. This appeals to both users and merchants who want faster transactions. With Litecoin, you get both security and speed. And this speed just kicked up a notch. On May 10, 2017, Segregated Witness (SegWit) was activated in the Litecoin blockchain. SegWit is the process in which blocks in the blockchain are made smaller by the extraction of signature data from transactions. This process allows Litecoin to process lightning fast payments. The first of these payments happened on May 11, 2017. Money was sent from Zurich to San Francisco in under a second. In the world of digital currency, the number of coins that can exist is finite. There can never be more than a certain amount of bitcoins in the world, and the same applies to litecoins. But the total amount of coins that can exist varies by digital currency. This actually works in Litecoin’s favor. Litecoin will eventually have more coins on the market than Bitcoin. And that appeals to consumers who want a simple, effective digital currency. A study by Dr. Judith Holdershaw, a senior lecturer at Massey University, concluded that 57% of retail shoppers opt for a product with a rounded price. Even more telling, 4% of those customers paid more just to round up the price. The proof is in the pudding: People like to pay with full numbers. This could explain our aversions to pocket change and loose bills. Because there will be fewer bitcoins in circulation, they will have to be broken down into decimals. That means you will end up paying 0.002 BTC for a cup of coffee. Outside transaction speed and volume, there's another key difference between the two currencies: the algorithms. For those of you who are completely new to digital currency, digital currencies are composed of codes. In the case of Bitcoin and Litecoin, those codes use two different algorithms. Bitcoin uses the SHA-256 hashing algorithm, and Litecoin uses a scrypt-hashing algorithm. Now, both of these algorithms are powerful. But over the years, the SHA-256 has made it more and more complex to get bitcoins through the mining process. Bitcoin miners have to employ increasingly complex technology to extract a relatively small amount of bitcoins. Litecoin’s scrypt-hashing algorithm makes it easier for miners to access the system. And the simplicity of Litecoin mining could actually steal Bitcoin miners. It's true that Bitcoin is worth significantly more than Litecoin, but most Bitcoin mining is carried out by supercomputers. The algorithms have become too hard for everyday miners to crack. It's clear that Litecoin will be a powerful digital currency. Of course, it’s still too early in the game to speculate on what tender will win the digital currency race. In fact, there could be no winner. The future financial system could operate through the use of dozens of digital currencies. And Litecoin will likely be one of them. Luckily for investors, Litecoin is a fairly easy digital currency to purchase. Its popularity and appeal have earned it a position on Coinbase, which remains the top digital currency software wallet. In fact, over the course of 2017, Coinbase added as many as a million new accounts per month. The simplest way to buy is to go to Coinbase's website and create an account. Once you've set up a username and password, you can plug in your banking information. You may buy digital currency on Coinbase with a credit card or through wiring money from your bank account. We wish you the best of luck in your investments! What the heck is going on with Bitcoin and Ethereum? Bitcoin and Ethereum have been blowing up. Jason Stutman shares some thoughts on investor hesitation and urges readers to avoid mistakes when investing in digital currencies and assets. Why is a cryptocurrency worth anything? Why does it have value? Briton Ryle explores these questions and more in light of the Bitcoin and Ethereum surge. On Friday, the SEC rejected the much anticipated Winklevoss Bitcoin Trust ETF. Here's how Bitcoin is fairing in the market. I've never been a believer in Bitcoin. There are some folks who've been lucky enough to profit, but far more who've lost their shirts. While cryptocurrencies are inevitable, this one is just the first, not the best.